UIGEA be damned, Full Tilt Poker is unleashing a massive World Series of Poker promotion on the general public that will see hundreds of its players take part in the World Series of Poker. 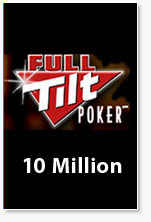 The most unbelievable promotion that Full Tilt is offering is the $10 Million dollar Main Event promotion. It's simple: if you qualify for the World Series of Poker through Full Tilt Poker and end up winning the Main Event, Full Tilt will pay you an addition $10 million dollars on top of whatever you win at the main event. This could mean a potential payday of $20 million dollars plus if you are lucky enough to take down the main event. -The 100 Seat Guaranteed tournament that takes place on June 17th. There will be hundreds of players at this year's main event that qualified at Full Tilt Poker; will you be one of them?